Because locoregional recurrence is the most common pattern of failure in HNC patients, improvement in outcomes focuses on local disease control.8 Randomized trials have demonstrated that IMRT for HNC patients provides better outcomes regarding salivary toxicity when compared to conventional three-dimensional techniques.9 Institutional experiences have also shown improvement in swallowing function and quality-of-life measures with IMRT.10,11 More recently, image guidance has been used for adaptive radiotherapy (ART) — the adjustment of treatment planning during the course of radiation to account for anatomic changes and improve the therapeutic index. Here we review the current state of ART along with its utility and indications. Head and neck radiation therapy provides a unique challenge in treatment delivery due to significant anatomic changes related to tumor response and weight loss that can occur during the course of treatment. 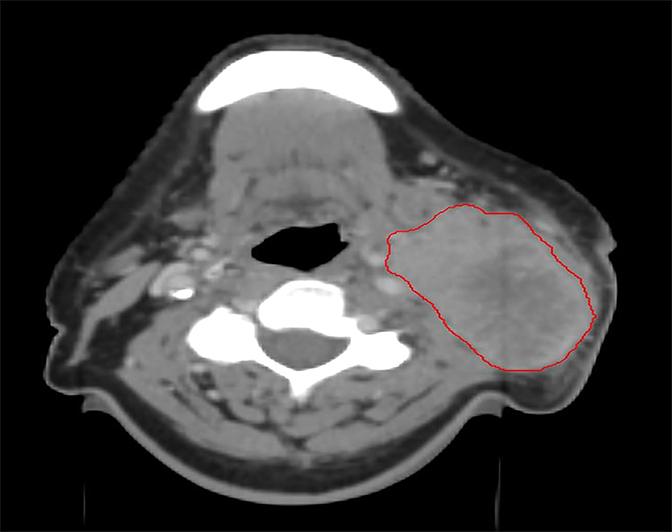 With expected anatomical changes of both tumor and normal tissue during a 5- to 7-week course of radiation, relying solely on computed tomography (CT) images acquired before therapy could lead to (1) underdosing of the tumor and/or (2) unnecessary exposure of organs at risk (OARs) to higher radiation doses. Cone-beam CT (CBCT)12 and CT-on-rails13 have also been used during treatment of HNC patients to demonstrate set-up variability during the radiation course with use of rigid bony structures as landmarks. Traditional treatment planning may not be adequate to account for these set-up uncertainties. ART, is one proposed solution to these challenges, but significant effort is required to adapt a radiotherapy plan, and benefits are unclear. Several studies have demonstrated compromised tumor coverage throughout the course of treatment. Barker et al tracked volumetric changes in gross tumor volume (GTV) as well as normal structures. They reported a reduction in GTV at a median rate of 1.8% per treatment day with a median cumulative reduction of 69.5% at the end of treatment. This study also noted changes in the geometric center of the GTV indicating that tumor reduction was asymmetric. Parotid glands decreased in volume as well, with observed medial displacement.14 Figure 1 is an example of anatomic change during the course of treatment. As demonstrated, conventional IMRT planning can lead to underdosing of the tumor, as well as increased dose to normal critical structures when one does not account for anatomic changes over the treatment course. Recent advances have centered on using image guidance for ART to allow for changes in radiation planning over the radiation course. ART, or adaptive replanning, refers to any strategy that repeats the treatment planning process during the course of radiotherapy in response to anatomic changes in the target volume or nearby critical structures. These changes in the treatment plan can be made midcourse either manually or via automated algorithms to improve the therapeutic index and maximize local control while reducing toxicity. Below we review evidence demonstrating the benefits, challenges and future directions of ART. Initial prospective clinical trials have demonstrated a dosimetric benefit with use of ART in HNC patients. 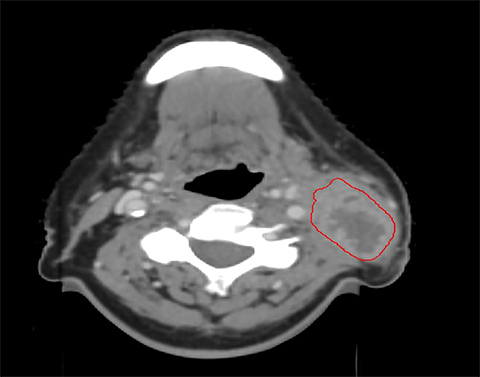 Schwartz et al reported on 22 patients with oropharyngeal squamous cell carcinoma who were prospectively enrolled at MD Anderson Cancer Center, Houston, Texas, to undergo adaptive replanning.17 Daily in-room CT-on-rails or CB CT images were used to track anatomical changes, and deformable image registration was used to align baseline contours onto new images for replanning if needed, with all patients undergoing 1 or 2 replans. Adaptive replans were aggressively conformal with no PTV expansion. ART significantly reduced the mean dose to the ipsilateral parotid gland by 3.9% (p = 0.002) and contralateral parotid glands by 2.8% (p = 0.003). Dose reduction to the parotids was, in fact, more pronounced in patients who underwent a second replan during treatment (ipsilateral 9%, p = 0.001, contralateral 3.8%, p = 0.026). ART also reduced integral body dose (oral cavity, lower oropharynx, larynx) receiving 60 Gy by 31 cc (p = 0.019). Initial reports indicated excellent local control18 although one outlier had significant disease progression between planning CT and the first treatment, which skewed target dosimetric data. Figures 2 and 3 demonstrate an adaptive replan with corresponding dosimetric implication. In reporting clinical outcomes, Schwartz et al demonstrated 100% local and 95% regional disease control at 2 years.18 This was the first prospective look at clinical outcomes with ART, and acute toxicity at 1 year was equivalent to toxicity profiles observed with conventional IMRT. Tumor volume prior to treatment was significantly correlated with volumetric response to treatment. This further reduction in tumor size did not correlate with any increased toxicity, indicating that adaptive replanning could keep dose targeted to the tumor and away from normal structures even in patients with significant anatomical changes. However, the percentage of parotid volume reduction was correlated with increased duration of a percutaneous endoscopic gastrostomy (PEG) tube use.18 The excellent disease control rates reported in this study also indicated that highly conformal ART did not lead to marginal target misses. Although comparative data is limited, 1 published study reported an institutional experience comparing ART outcomes with those of conventional IMRT in HNC.19 Of 317 patients treated with IMRT at UC Davis Medical Center, Sacramento, California, who were retrospectively reviewed, 51 (16%) had undergone adaptive replanning during the course of treatment. Daily IGRT imaging was used, and there was no standardization for when or if ART was done. The decision to use ART was multifactorial and considered nutritional status, tumor reduction seen on daily images, and/or significant weight loss. The subset of patients who underwent ART had more advanced disease. Two-year overall survival was similar for patients undergoing ART in comparison to those without it; however; ART improved local control at 2 years, with 88% compared to 79% for those with conventional IMRT (p = 0.01). This finding was significant on matched-pair analysis as well. Also of note, the local failures with ART were within the high-dose PTV regions. The use of ART was not found to significantly reduce the incidence of grade 3 or higher toxicity, acute hospitalization, or the need for a feeding tube. Consequently, this retrospective study was the first to report a significant clinical advantage with the use of ART. While subject to selection bias, the findings are notable given that the patient subset who underwent ART had significantly improved local control despite more advanced T and N staging at baseline. Although the studies discussed did not show a toxicity benefit, 1 study by Yang et al of 129 patients with nasopharyngeal carcinoma reported an improvement in global quality-of-life scales when IMRT with replanning was used, compared to those without ART.20 The EORTC (European Organization for Research and Treatment of Cancer) Quality of Life Questionnaire C30 was given to patients before treatment and 1, 3, 6, and 12 months after treatment. Those who underwent replanning had improved quality-of-life measures starting at 1 month after treatment despite having worse measures before therapy. The improved quality of life was maintained at 12 months (p = 0.012). Toxicity benefits may have been precluded in other ART studies due to imbalance in tumor bulk between the standard and ART cohorts. To this point, the theoretical advantage of ART for dosimetric and clinical parameters has been established in multiple studies; however, the challenge remains in developing a standardized mechanism that addresses when to initiate ART. ART is labor-intensive and should be reserved for those who are most likely to benefit. Ahn et al reported their experiences with 23 HNC patients who had prospectively planned rescans at 11, 22, and 33 fractions, but 35% of patients did not have a dosimetric benefit with ART, underscoring the need for careful selection.21 In reporting their retrospective institutional experience comparing ART with conventional IMRT, Chen et al used markers such as significant weight loss, an ill-fitting immobilization mask, significant shrinking of palpable disease, or an extended treatment break to initiate replanning.19 While not standardized, selection based on treatment factors that were expected to be associated with anatomical change demonstrated clinical benefit with ART. A study by You et al reported that easily measured anatomic changes in neck size and patient weight may be related to side effect profiles.24 Patients undergoing IMRT for HNC were monitored for xerostomia. Those with increased (> 10%) reduction in neck diameter or increased (> 5%) weight loss had a significantly greater rate of grade 2 or higher xerostomia. These patients also had a 23% increase in daily V0.75 Gy to the parotid glands by the end of treatment. While the patient group was small and there were confounding factors, the findings show a potential role for adaptive replanning in patients with visible anatomic changes. At our institution, the practice has been to use daily cone-beam imaging to monitor anatomic changes during treatment of HNC patients. Many have used parameters such as change in source-to-skin distance (SSD), percentage of weight loss, ill-fitting mask, and “significant” change in body/tumor contour on daily CBCT as possible triggers for ART. We do not know which approach is the best. Our institutional practice is to assess for adaptive replanning at weeks 3-4 of definitive radiation. Patients with significant weight loss or disease regression causing visible geometric changes to target volumes that excessively cover uninvolved organs or skin are targeted for ART. In our institutional study, a cohort of 203 patients with locally advanced HNC who underwent IMRT from 2009 – 2014 was studied. Of them, 87 patients (43%) underwent adaptive replanning; patients were treated to a mean total dose of 70 Gy with adaptive replanning performed at a mean dose of 44 Gy.29 Those undergoing ART had significantly higher rates of N2b-3 disease (83% vs. 62%; p = 0.001) and stage IVb disease (17.2% vs. 3.4%; p = 0.0002). Despite this increased burden of disease, patients undergoing ART had similar rates of locoregional failure (5.2% vs. 9.2%; p = 0.24) and 2-year overall survival (87.3% vs. 86.8%; p = 0.79) as those undergoing conventional IMRT. Acute toxicity rates were also similar between the 2 groups, suggesting a role for ART to offset expected increased toxicity in patients with more advanced disease. The pattern of disease regression over the course of radiation is believed to be different for primary vs. nodal disease. While nodal disease (without extracapsular extension [ECE]) is expected to exhibit circumferential regression, the primary mucosal disease often regresses leaving discontiguous islands of disease. Our institutional practice has been to recontour the regressed GTV at the time of replan. However, our primary replanned CTV is then expanded to ensure that all initial mucosal extent of disease /adjacent involved structure is included in this volume, as suggested by the NRG-HN002 protocol. For nodal volumes, the adapted GTV represents the regressed nodal disease when there is no obvious evidence of ECE. When evidence exists for upfront ECE (e.g., loss of fat planes with adjacent muscle), the adaptive nodal CTV is again increased to include the initial areas at risk. The initial simulation CT can be used to anticipate and prevent the need for an adaptive replan. For example, in the era of HPV-positive disease in the oropharynx, the presence of a cystic node can be expected to enlarge during the course of RT; thus, a larger PTV may initially be given to account for this growth. Some centers use deformable registration to adapt the latest CBCT to the initial CT scan and replan based off the CBCT. Our approach has been to repeat a CT simulation with a new aquaplast mask if necessary and recontour volumes, as described. With this approach, two datasets are now available for the same patient with differing anatomical contours. Creating a sum plan combining the initial plan and the new plan would be at best an arithmetic summation of dose for the various structures and not a true estimate of the dose. Our approach has been to generate a new plan and deliver the remaining fractions using the new plan. We believe this to be a safe, albeit labor-intensive, approach. The value of ART may not only be limited to the adaptation of treatment volumes during therapy, but may also be used to determine which patients may benefit from dose escalation during treatment. Yang et al retrospectively reviewed the use of ART with 76 patients with oropharyngeal and hypopharyngeal cancers, and on multivariate analysis demonstrated that a primary GTV prior to treatment > 30 cc as well as tumor volume reduction rate < 50 % after treatment were prognostic for poor local control.28 A similar finding was reported by Lee et al who noted that tumor volume reduction rate measured during ART in 59 patients with oropharyngeal cancer was a significant prognostic factor for local control on multivariate analysis.30 These findings point to the importance of identifying patient groups with decreased volumetric response to therapy during treatment. Prospective trials are needed to validate these theoretical considerations, and ART techniques will form the foundation for these protocols. While there is no clear consensus as to which HNC patients should undergo adaptive replanning, the use of ART is becoming more commonplace in today’s clinical practices. Multiple studies indicate the dosimetric benefits of ART when used in selective subsets of patients, although clinical implications of this remain unclear. A single institution retrospective study has demonstrated improved local control with use of ART, while toxicity benefits are yet to be clearly demonstrated. Much work remains to be done to clearly establish the benefits of routine use of ART. Initial retrospective studies have attempted to identify prognostic factors for tumor volumetric reduction to help decide at baseline whether a patient will need ART or not; however, further prospective trials are needed. ART still remains labor and resource intensive and future improvements in ART, including automated replanning processes and improved image guidance, will make ART a more economical option. Brizel DM, Albers ME, Fisher SR, et al. Hyperfractionated irradiation with or without concurrent chemotherapy for locally advanced head and neck cancer. N Engl J Med. 1998;338(25):1798-1804. Adelstein DJ, Li Y, Adams GL, et al. An intergroup phase III comparison of standard radiation therapy and two schedules of concurrent chemoradiotherapy in patients with unre sectable squamous cell head and neck cancer. J Clin Oncol. 2003;21(1):92-98. Forastiere AA, Zhang Q, Weber RS, et al. Long-term results of RTOG 91-11: a comparison of three nonsurgical treatment strategies to preserve the larynx in patients with locally advanced larynx cancer. J Clin Oncol. 2013;31(7):845-852. Lee N, Xia P, Fischbein NJ, et al. Intensity-modulated radiation therapy for head-and-neck cancer: The UCSF experience focusing on target volume delineation. Int J Radiat Oncol Biol Phys. 2003;57(1):49-60. Ezzell GA, Galvin JM, Low D, et al. Guidance document on delivery, treatment planning, and clinical implementation of IMRT: report of the IMRT Subcommittee of the AAPM Radiation Therapy Committee. Med Phys. Aug 2003;30(8):2089-2115. Garden AS, Morrison WH, Wong PF, et al. Disease-control rates following intensity-modulated radiation therapy for small primary oropharyngeal carcinoma. Int J Radiat Oncol Biol Phys. 2007;67(2):438-444. Eisbruch A, Ten Haken RK, Kim HM, Met al. Dose, volume, and function relationships in parotid salivary glands following conformal and intensity-modulated irradiation of head and neck cancer. Int J Radiat Oncol Biol Phys. 1999;45(3):577-587. Denis F, Garaud P, Bardet E, et al. Final results of the 94-01 French Head and Neck Oncology and Radiotherapy Group randomized trial comparing radiotherapy alone with concomitant radiochemotherapy in advanced-stage oropharynx carcinoma. J Clin Oncol. 2004;22(1):69-76. Clark CH, Miles EA, Urbano MT, et al. 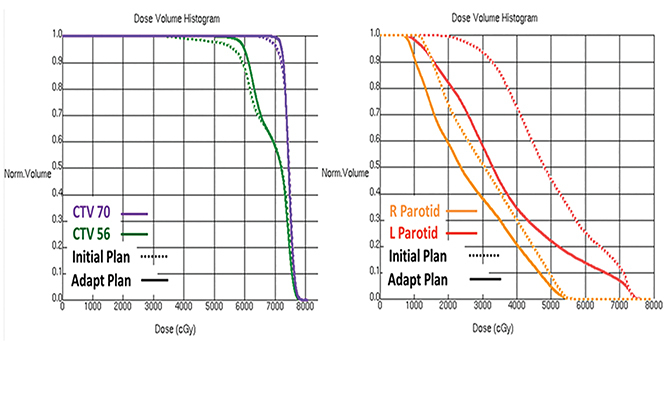 Pre-trial quality assurance processes for an intensity-modulated radiation therapy (IMRT) trial: PARSPORT, a UK multicentre Phase III trial comparing conventional radiotherapy and parotid-sparing IMRT for locally advanced head and neck cancer. Br J Radiol. 2009;82(979):585-594. Feng FY, Kim HM, Lyden TH, et al. Intensity-modulated radiotherapy of head and neck cancer aiming to reduce dysphagia: early dose-effect relationships for the swallowing structures. Int J Radiat Oncol Biol Phys. 2007;68(5):1289-1298. Eisbruch A, Levendag PC, Feng FY, et al. Can IMRT or brachytherapy reduce dysphagia associated with chemoradiotherapy of head and neck cancer? The Michigan and Rotterdam experiences. Int J Radiat Oncol Biol Phys. 2007;69(2 Suppl):S40-42. van Kranen S, van Beek S, Rasch C, et al. Setup uncertainties of anatomical sub-regions in head-and-neck cancer patients after offline CBCT guidance. Int J Radiat Oncol Biol Phys. 2009;73(5):1566-1573. Zhang L, Garden AS, Lo J, et al. Multiple regions-of-interest analysis of setup uncertainties for head-and-neck cancer radiotherapy. Int J Radiat Oncol Biol Phys. 2006;64(5):1559-1569. Barker JL, Jr., Garden AS, Ang KK, et al. Quantification of volumetric and geometric changes occurring during fractionated radiotherapy for head-and-neck cancer using an integrated CT/linear accelerator system. Int J Radiat Oncol Biol Phys. 2004;59(4):960-970. Hansen EK, Bucci MK, Quivey JM, et al. Repeat CT imaging and replanning during the course of IMRT for head-and-neck cancer. Int J Radiat Oncol Biol Phys. 2006;64(2):355-362. O’Daniel JC, Garden AS, Schwartz DL, et al. Parotid gland dose in intensity-modulated radiotherapy for head and neck cancer: Is what you plan what you get? Int J Radiat Oncol Biol Phys. 2007;69(4):1290-1296. Schwartz DL, Garden AS, Shah SJ, et al. 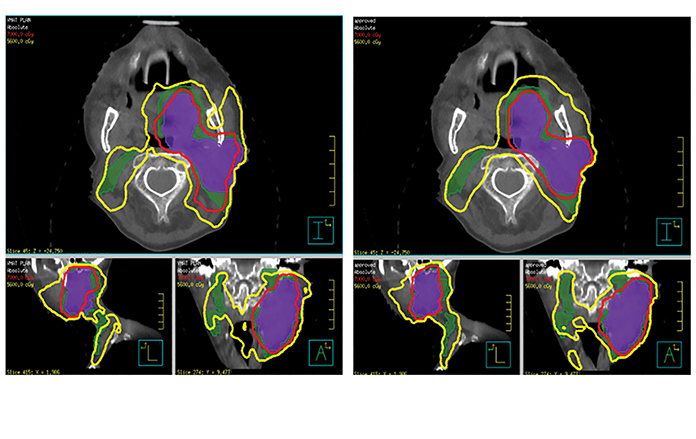 Adaptive radiotherapy for head and neck cancer--dosimetric results from a prospective clinical trial. Radiother Oncol. 2013;106(1):80-84. Schwartz DL, Garden AS, Thomas J, et al. Adaptive radiotherapy for head-and-neck cancer: initial clinical outcomes from a prospective trial. Int J Radiat Oncol Biol Phys. 2012;83(3):986-993. Chen AM, Daly ME, Cui J, et al. Clinical outcomes among patients with head and neck cancer treated by intensity-modulated radiotherapy with and without adaptive replanning. Head Neck. 2014;36(11):1541-1546. Yang H, Hu W, Wang W, et al. Replanning during intensity modulated radiation therapy improved quality of life in patients with nasopharyngeal carcinoma. Int J Radiat Oncol Biol Phys. 2013;85(1):e47-54. Ahn PH, Chen CC, Ahn AI, et al. Adaptive planning in intensity-modulated radiation therapy for head and neck cancers: single-institution experience and clinical implications. Int J Radiat Oncol Biol Phys. 2011;80(3):677-685. Surucu M, Shah KK, Mescioglu I, et al. Decision trees predicting tumor shrinkage for head and neck cancer: implications for adaptive radiotherapy. Technol Cancer Res Treat. Mar 2 2015. Pignon JP, le Maitre A, Maillard E, Bourhis J. Meta-analysis of chemotherapy in head and neck cancer (MACH-NC): an update on 93 randomised trials and 17,346 patients. Radiother Oncol. 2009; 92(1):4-14. You SH, Kim SY, Lee CG, et al. Is there a clinical benefit to adaptive planning during tomotherapy in patients with head and neck cancer at risk for xerostomia? Am J Clin Oncol. 2012;35(3): 261-266. Bhide SA, Davies M, Burke K, et al. Weekly volume and dosimetric changes during chemoradiotherapy with intensity-modulated radiation therapy for head and neck cancer: a prospective observational study. Int J Radiat Oncol Biol Phys. 2010;76(5):1360-1368. Bosmans G, van Baardwijk A, Dekker A, et al. Intra-patient variability of tumor volume and tumor motion during conventionally fractionated radiotherapy for locally advanced non-small-cell lung cancer: a prospective clinical study. Int J Radiat Oncol Biol Phys. 2006;66(3):748-753. Britton KR, Starkschall G, Tucker SL, et al. Assessment of gross tumor volume regression and motion changes during radiotherapy for non-small-cell lung cancer as measured by four-dimensional computed tomography. Int J Radiat Oncol Biol Phys. 2007;68(4):1036-1046. Yang SN, Liao CY, Chen SW, et al. Clinical implications of the tumor volume reduction rate in head-and-neck cancer during definitive intensity-modulated radiotherapy for organ preservation. Int J Radiat Oncol Biol Phys. 2011;79(4):1096-1103. Joshi NP, Ward MC, Greskovich JF, et al. Comparing image guidance based adaptive IMRT planning for head and neck cancers with standard IMRT: a safety and efficacy analysis. Abstract accepted to 57th annual ASTRO Meeting, San Antonio, TX. 2015. Lee H, Ahn YC, Oh D,et al. Tumor volume reduction rate measured during adaptive definitive radiation therapy as a potential prognosticator of locoregional control in patients with oropharyngeal cancer. Head Neck. 2014;36(4):499-504. Adaptive radiation therapy for head and neck cancer. Appl Rad Oncol. Drs. Juloori and Ward are Resident Physicians in the Department of Radiation Oncology, Taussig Cancer Institute at Cleveland Clinic, Cleveland, OH. Dr. Joshi is a Clinical Fellow, and Dr. Xia is Chief Physicist, Department of Radiation Oncology at Cleveland Clinic. Mr. Murray, Dorfmeyer, and Potter are Medical Dosimetrists at Cleveland Clinic. Drs. Greskovich and Koyfman are Assistant Professors of Radiation Oncology at Cleveland Clinic.